Click on Books or links below to go to guidebook pages. "For all the guidebooks out there that read well or look pretty, this one simply rolls up its sleeves and gets the job done." After 30 years of writing and publishing our guidebooks, and after a lot of thought and consideration, we handed over the titles of our guidebooks to HEMA Maps (https://www.hemamaps.com) (as of early 2016). This has freed us up to concentrate on writing articles of our travels for various magazines and other publications. We will however be contributing to updating and writing some of HEMA’s guidebooks, and as such our own guidebooks, along with all our knowledge and expertise, will be incorporated into their publications. We are now out of all stock we had of our Cape York & Kimberley guidebooks. We still however have stock available for purchase from this web site of our Flinders Ranges & Across the Bight & Nullarbor guidebooks. 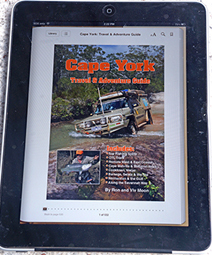 Hema Maps has a new edition of their Cape York Atlas/Guidebook due for publication around September 2017, and which will incorporate some of our information into the same. We have also worked on writing and updating their Kimberley Atlas/Guide and Hema will have copies of that book available around November 2017. We will be selling these books through our web site and will certainly have information on their availability as soon as they are published and we have copies available. We would like to thank everyone who purchased copies of our guidebooks for all their support and we hope we made your travels that much more enjoyable, and will continue to do so through our association with Hema Maps. eBooks - ALL GUIDEBOOKS & Cookbooks now available as an ebook (go to link here).